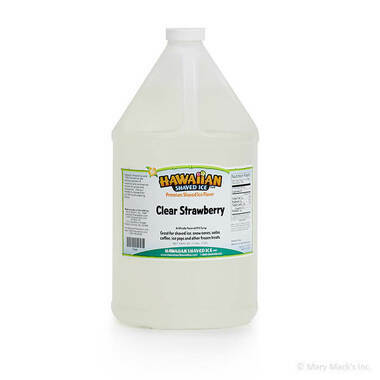 Rediscover your favorite strawberry shaved ice flavor when you take a bite out of clear strawberry snow cone syrup from Hawaiian Shaved Ice. We may be able to hide the color of strawberry shaved ice, but we can never keep the delicious flavor hidden away. It�s just too good! 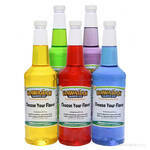 Kids and adults alike can now enjoy the great taste of strawberry sno cones, without turning their mouths red. 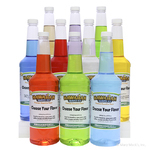 Imagine a world without stains from the sweet treats that we love! Experience that now with clear strawberry shaved ice! Buy a gallon of this magical treat from Hawaiian Shaved Ice. The classic taste will be a guaranteed hit at your next party or gathering, and the invisible flavor will be even more popular! Everyone will love the mystery of the clear strawberry snow cone syrup. We also have this flavor available in the quart size, as well as part of an assorted package, so you can include other great shaved ice flavors!